This guided, 1-hour tour begins at the Habaneros Cigars Factory and Lounge in West Palm Beach. Select from any tour time, on the hour between 11am and 5pm. The tour guide will provide ample information regarding the city of Tampa and how it was built around the cigar industry. 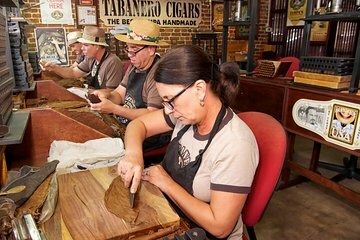 Learn about the process of manufacturing hand-made cigars and watch as Cuban-born artisans roll cigars at the Habaneros factory. Discover the aging process and enjoy the different scents inside the walking humidor. Also, watch a demonstration on how to cut, punch, light, and set off the hand-made cigars the correct way. A minimum of two people (and maximum of 10) are allowed on this educational and entertaining small-group tour. A cup of coffee is included.